CAFOD supporters and volunteers are invited to join together for a gathering to mark the start of the Harvest Fast Day appeal. The meeting at St Theresa’s Church Hall in Leeds will allow ideas to be shared about how parishes can help through prayer, fundraising and campaigning. The gathering is open to anyone and will take place at 10am on Wednesday September 6. CAFOD representative in Leeds, Bronagh Daly, said: “This is a great opportunity to share your thoughts in a friendly atmosphere and I am sure there will lots of great ideas shared. To find out more about CAFOD’s Harvest Day appeal, visit our website. 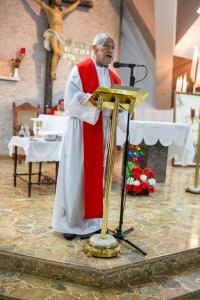 Today marks the start of the season of Lent, a time when the Catholic community traditionally enter a period of prayer, almsgiving and fasting. Today is also the start of CAFOD’s Lent Appeal, which means that donations received until Sunday 17th May will be matched £1 for £1*, by the UK government. We are asking volunteers and supporters to help us take advantage of this wonderful opportunity by reading out our appeal letter at Mass for our Fast Day Appeal. If you haven’t already, please help us by arranging to read out the appeal letter in your parish, which we know makes a huge difference to how much a parish community responds to our appeal. To get up to speed on how you can support our Lent appeal in your parish, please read through our Lent 2015 Volunteer Tool Kit. Our simple Lent 2015 parish ‘how to’ guide will help answer any questions you need to be able to support the appeal. Also, our Lent 2015 A3 and A4 posters can be see below and we can send copies to you to display in your parish. We have some wonderful resources to support prayer and reflection this Lent including, Stations of the Cross, Children’s Liturgy, and a Fast Day Prayer. Our online Lenten Calendar provide a prayer and reflection for each day of Lent. Our country focus this year is on Myanmar, where rebuilding your life after a devastating storm can seem an impossible task. But it was what Kyin Nu and her husband had to do after a cyclone ripped through their community. They lost their business, the food they had worked so hard to produce and worst of all, two of their daughters were killed. Cyclone Nargis was the strongest cyclone ever to hit Myanmar (formerly named Burma). Over 150,000 people died, and 2.4 million were affected. Half of Kyin Nu’s village were killed. As with many storms, the poorest people suffered the most. 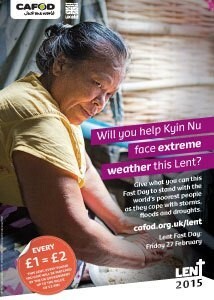 It has been a long, hard struggle for Kyin Nu, but your donations to CAFOD have made a real difference to the community. By planting trees, providing animals and paying people to rebuild roads and protective embankments, we have helped Kyin Nu and the rest of her community get back on their feet. *Lent matched funding offer only valid for donations to the CAFOD Lent Appeal up to a total of £5 million, and for donations received before 17 May 2015.